I had a bit of fun with this shot today. I wanted to capture the glowing coils of a toaster. Here is how I did it. First I got a toaster. Yes, you will need a toaster for this shot. I set the toaster up on a piece of white poster board. I propped the back of the toaster up a bit and angled it so that I would have a better view of the glowing coils. I used a tripod for this shot as I knew it was going to need a long shutter speed (30 sec.). I adjusted my aperture to f/6.3 and set my shutter speed to 30 sec. How did I come to those settings? Trial and error. With my flash in a Lumiquest Softbox III and set at 1/8th power, I fired off a few 30 second test shots and manually triggered the flash multiple times. I adjusted the aperture until I got what I liked. 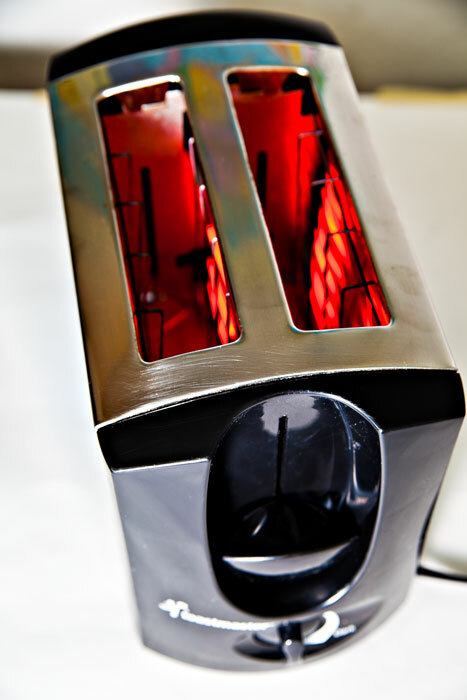 In this case I wanted the top front of the toaster to be in focus and the glowing coils to be a bit out of focus. I manually focused the camera, turned off the lights and with my camera set to f/6.3, my shutter speed at 30 seconds and my flash unit at 1/8th power; I triggered the shot with a wireless remote to avoid any camera shake. As the exposure was being taken I manually triggered the flash 4 times. First I fired it camera left, then camera right, then above and behind and finally above and aimed behind the toaster. Firing the flash multiple times gave me a nice exposure on the exterior of the toaster and the long 30 second shutter speed gave me a nice glowing interior. I’m always looking for interesting perspective shots so post your ideas and I just may use it for Project 365.